EMCO Remote Installer is an easy-to-use application deployment tool for small- and mid-sized organizations that you can also use to inventory the applications in your network. EMCO’s application deployment solution is available as a free and a pro version. This review is about Remote Installer Professional 4, and I will just talk about Remote Installer when I refer to the pro version. Many software deployment solutions need to be deployed themselves before you can start using them to deploy applications. Not so with Remote Installer. All you have to do is install the tool on your PC, which costs you a second or two, and two or three seconds later you have already installed your first application on a remote PC. Remote Installer has an agent and, although this is not required, you can deploy it to all machines in your network. When you first install an application on a PC, Remote Installer will automatically push its agent, the Remote Installer Service, to the remote machine. When I first deployed applications with the tool, I didn’t even notice this process. This is what I call “automation.” Note that the Remote Installer Service doesn’t have to run on remote PCs if you just want to inventory installed applications. When you first launch Remote Installer, you might be overcome by all its panes, bars, and icons. But the appearance is deceiving. Remote Installer is equipped with a flat learning curve. The complex appearance stems from the fact that the UI is highly customizable. Many controls have duplicates, which means that there are often multiple ways to accomplish a task. The point about this design is that it makes the user interface highly customizable. You can simply remove the panes and icons you don’t use. You can also move panes to different locations or undock them from the main application window. And, if you don’t like the tool’s colors, you can choose from various different skins. Even though Remote Installer is simple and intuitive to use, I recommend skimming through all the panes before you begin working with the tool because this will allow you to adapt the tool to your work style. Let’s have quick look at the different areas of Remote Installer. At the top is the Quick Access Toolbar. As with Microsoft Office, you put your most important shortcuts there. Below is the Ribbon with two tabs: the Installer tab and the Application tab. The main purpose of the Application tab is to customize Remote Installer. If you closed one of the tool’s panes, this is the place where you can bring it back. I found the Reset Workspace function useful. If you get lost with all your customizations, you can use this icon to reset everything to its original state. The Installer tab contains all the icons you need to install software or scan your network. I stopped using this toolbar after a while because most of the functions can also be accessed by right-clicking objects. As with Microsoft Office, you can minimize the Ribbon to get more space for the rest of the panes. The Network pane on the left displays all the machines in your network. Remote Installer recognizes Active Directory containers, but you can also work with custom groupings. The main area is the pane at the center of the application. It has four tabs. The Welcome tab is helpful when you try the tool for the first time. The Software Inventory tab shows all the applications that Remote Installer found in your network. The contents of this pane depends on the computers you selected in the Network pane. If you select a single machine, you’ll only see its installed applications. The next tab has two areas and lists all your software deployment tasks. One area is reserved for the calendar of the scheduled tasks, and the second area shows all your tasks in a table. The Inventory Snapshots tab is useful if you need information about the applications that have been installed in the past on the PCs in your network. Below the main area are four tabs with information about the previous results or ongoing tasks. You have a customizable table with data about the machines in your network, the Task Execution Results with troubleshooting advice, the Application Log with information on previous events, and Operations Management, which displays data about currently running tasks. Before you can deploy applications, you have to scan your network. Remote Installer will find computers that are offline if you have an Active Directory domain. You can also import computers from a text file or add machines manually, for instance by specifying an IP range. The latter is useful if you don’t have an Active Directory and you want to manage machines in remote subnets. Remote Installer offers various ways to deploy applications. The easiest way is Quick Install, where you only have to select the machines and the setup file and, a mouse click later, your application is running on the remote computers. You can use any type of installation program; however, working with the MSI format (Windows Installer) is recommended because this format offers standardized options for silent installs. 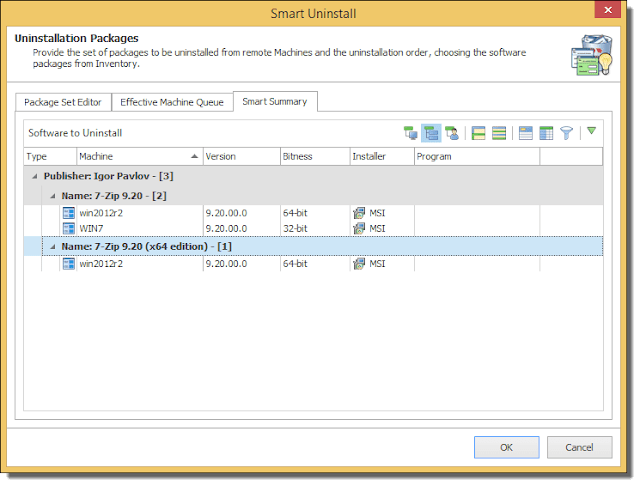 If you have a setup program in a different format, you might consider converting it first with EMCO’s MSI Package Builder. In particular, if you use the other options (described below) for deploying applications, you will appreciate the functionality that the Windows Installer provides. The other three installation options are similar in functionality. The difference between Install Now and New Task is that Remote Installer will save all your settings as a task with the latter option. This allows you to later repeat a modified version of the task. You can also copy one or multiple tasks into a new task, which enables you to combine multiple deployment configurations into one task. The fourth option is Scheduled Tasks, which lets you run tasks at specific times and configure recurrences. After you specify the installer file, the task generation wizard asks you if your setup file is a generic package or a multi-platform package. Remote Installer can distinguish between 32-bit and 64-bit targets. This allows you to add the 32-bit and the 64-bit version of an MSI file to a task. 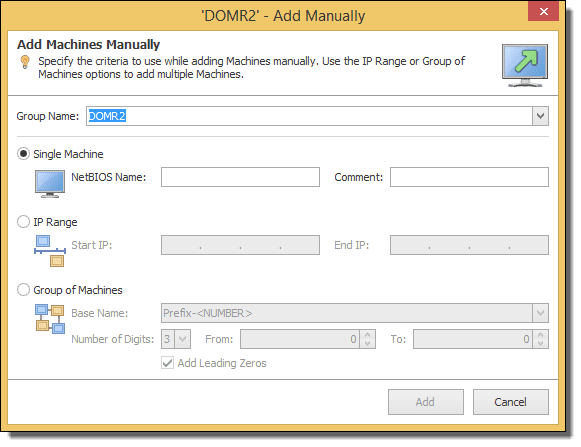 Remote Installer then assigns the correct setup program for each machine automatically. Next, you can configure the restart behavior—that is, whether to restart the computer automatically after the installation, to ask the user before the restart, or to not reboot the computer at all. On the next screen, you define various advanced settings. You can add MST files (MSI Transformers), which allows you to modify an MSI-based installation. For instance, you could determine which components of an application are installed or add a license key. Remote Installer also supports Windows Installer properties, which enables you to configure the deployed application. For example, you could disable the program’s auto update feature. As you might know, Windows Installer logs various types of information during the installation process. This can be useful if you have to troubleshoot a failed installation. You can easily configure which of these logs to activate and store in Remote Installer’s database. And, last but not least, the tool supports actions such as modifying the Registry or running a PowerShell script before or after the installation process. On the last screen of the task creation wizard, you will be asked whether you want to deploy your application only to available computers or expand the scope to computers that are currently marked offline in Remote Installer. In the latter case, Remote Installer can scan the network first before it starts with the deployment process. You can also add machines manually or import computers from a file at this point. What Remote Installer can’t do, however, is deploy programs to machines that are offline. This means the tool is unable to automatically recognize when a machine comes online to start a missed deployment job. Of course, you can also uninstall software with Remote Installer. The options are comparable to the installation procedures. Essentially, you just have to choose the machines and an application in the inventory database. It is worth noting that you can also uninstall applications that you didn’t install with Remote Installer. In that case, you have to provide the corresponding setup file. You can also uninstall software updates with the help of MSP files. In addition, Remote Installer enables you to repair applications. The advantage over just reinstalling a malfunctioning application is that the user settings will usually stay untouched. Using the repair method will ensure that missing files and Registry settings will be deployed to the remote machines. Remote Installer doesn’t update its software inventory database after an installation or uninstallation task. Thus, if you want to know the present status of your PCs, you have to manually rescan your network. However, this is not really a big deal in a small network if you use the tool’s Quick Scan feature (which scans only the machines that are already in the database) because it only takes a couple of seconds to rescan a machine. Other than this little shortcoming, I like Remote Installer’s software inventory capabilities. You get all the information you need about the publisher, installation date, version, bitness, etc. By selecting the machines that interest you, you can get an overview of the installed applications on these computers. Remote Installer also allows you to easily access previous states by choosing an older snapshot, and you can compare snapshots to display the changes that have been made to selected machines. 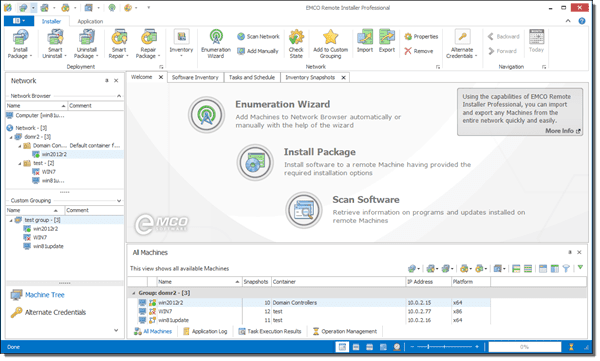 Version 6 of EMCO MSI Package Builder includes Windows 10 MSI compatibility and a streamlined UI, and it makes driver/application deployment much easier. In December, EMCO offers a 20% discount. Even as Microsoft pushes the modern app, most applications still use legacy executables or packaged MSIs for installation. If you manage any number of Windows clients, you should be familiar with packaging and deploying MSIs. Being able to quickly take an EXE, convert it to an MSI, and deploy it with Group Policy (or another application) is one skill that can save you a ton of time. Having the ability to customize MSIs allows you to deploy applications tailored for your environment. By using EMCO MSI Package Builder, you can easily edit existing packages or convert an EXE into a deployable MSI. 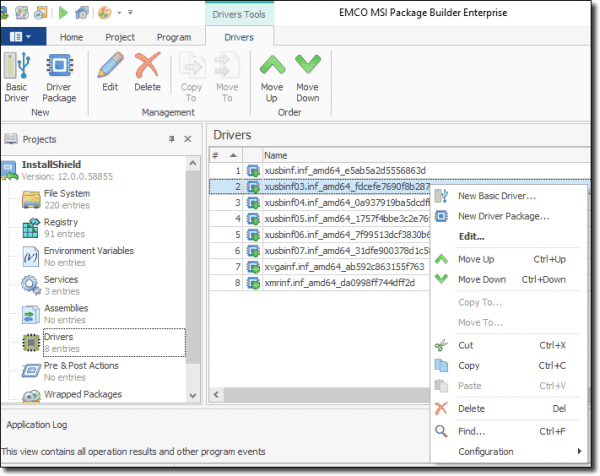 The newly updated EMCO MSI Package Builder 6 brings three big features and dozens of smaller improvements. With this update, we have an easy method to control driver installations in MSIs, a simple and powerful UI design, and full Windows 10 MSI compatibility. EMCO MSI Package Builder comes in two flavors: a Professional edition and an Enterprise edition. The Professional edition includes an easy-to-use visual MSI editor and can do live monitoring of repackaging. The Enterprise edition is designed for complex installations or conversions. It includes more powerful change monitoring tools that include the ability to create services, customize environment variables, and control driver installations. Managing applications that also install drivers has always been more difficult than it should be. Applications, such as external video cards or interactive white boards, frequently need to install several drivers during installation. 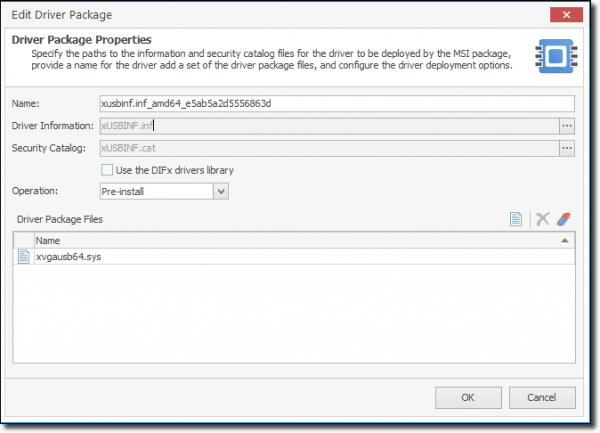 The Enterprise edition of EMCO MSI Package Builder can track and package driver installations in a monitoring scenario. When a monitored package includes drivers, be sure to accept any trust prompts and to not reboot after the installation completes. When the installer is done and EMCO MSI Package Builder has generated the MSI content, you should see your installed drivers under the Drivers category. Packages that require drivers can also be installed manually. To do this, create a new package and navigate to the Drivers section. If your driver includes just an INF, select New Basic Driver. Likely, your driver will have a multitude of files that are needed. If so, choose New Driver Package. From here, you can choose your driver files, set your security catalog, and decide on the driver installation mode. I love having the ability to deploy and manage drivers with applications! This driver package includes an INF, a CAT, and a SYS file. As a side tip, you can pull these extracted files out of c:\windows\System32\DriverStore\FileRepository\ on a machine that has your application installed on it. 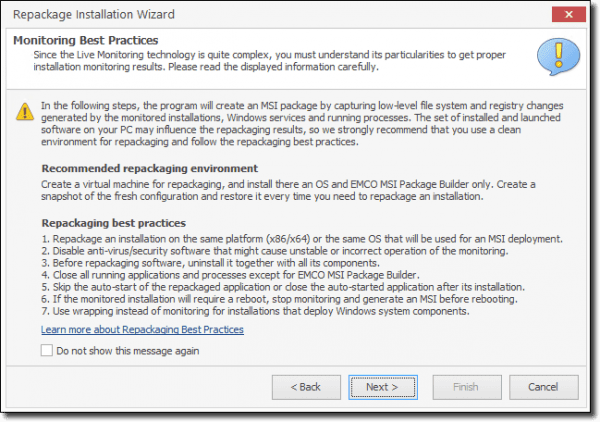 One of the things I like best about EMCO MSI Package Builder is that MSIs are packaged to industry best practices. The rules for package creation are kept updated for the latest Windows operating systems. Version 6 includes full compatibility support for Windows 10. 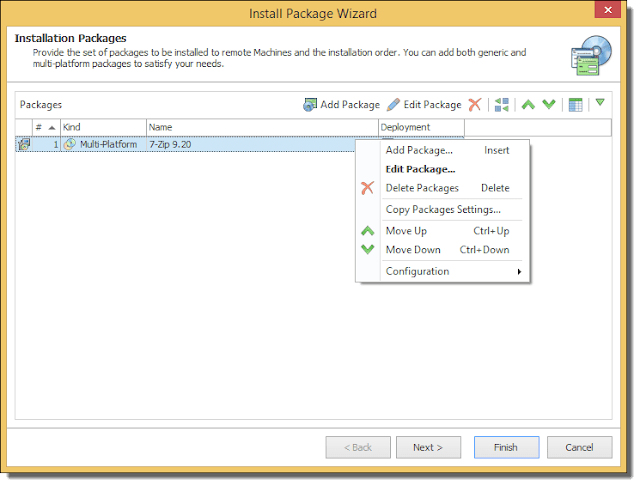 If you are new to repackaging applications (or haven’t set up a reference VM in a while), the Repackage Installation Wizard provides guidance on proper machine configuration. EMCO MSI Package Builder will also check certain configurations on startup. For example, it will not let a package be created if the logged-on user uses folder redirection. However, as a best practice, your reference machine should not be domain joined and the logged-on user should have no non-standard configurations set on it. If you have ever worked with the old table-based MSI editing tool, Orca, you will appreciate the logical design that EMCO MSI Package Builder uses. Each core component of the MSI is separated out. If you need to add a file to the MSI, you do it in a single step (not the 3+ steps that tools such as Orca require). This simplicity holds true across the new UI. Where possible, hierarchical views are shown instead of the flat tables that you may be used to. This makes finding and editing specific settings so much easier. Wizards, such as change monitoring, have been streamlined as well. Simplification doesn’t come at a loss of features, however. Advanced settings are still available in any of the wizards or in package creation. EMCO MSI Package Builder continues to get better with each release. Version 6 brought several great new features and dozens of small improvements. In this review, we focused specifically on driver deployments, best practices, and the improved UI. Remote Installer is designed to be used by a single admin. This means it has no separate backend application and no independent console, so that multiple admins could work simultaneously. The tool allows you to store its database on a network share; in theory, this means that multiple admins can use Remote Installer from their desktops. However, they should not work with the tool at the same time because this can cause conflicts. Also note that the Remote Installer console must be running when a scheduled task is supposed to run. However, if you start the tool after a missed scheduled task, Remote Installer will inform you and allow you to start the corresponding task manually. Just to be clear, Remote Installer is no competitor to Microsoft’s Configuration Manager or comparable complex system management solutions for large enterprises that require you to rummage through a couple of books until your first application is deployed. Remote Installer is the kind of tool that a single admin uses to push out applications quickly in a small network, say, with fewer than 200 machines. As you saw in this review, Remote Installer is much more flexible than Group Policy software deployment. Another plus of Remote Installer is its pricing, which is very competitive. A site license for an unlimited number of nodes costs just $299. This makes the tool worth considering even if you already have an enterprise software deployment solution that is a bit sluggish. This enables you to deploy an application that is needed immediately on a user’s desktop, without delay and with instant feedback about the success of the installation.